"San Bernardino" and "City of San Bernardino" redirect here. For other uses, see San Bernardino (disambiguation). In August 2012, San Bernardino became the largest city to choose to file for protection under Chapter 9 of the U.S. Bankruptcy code; this has been superseded by Detroit's filing in July 2013. San Bernardino's case was filed on August 1. On December 2, 2015, a terrorist attack left 14 people dead and 22 seriously injured. Politana was the first Spanish settlement in the San Bernardino Valley, named for Bernardino of Siena. Politana was established May 20, 1810, as a mission chapel and supply station by the Mission San Gabriel in the a rancheria of the Guachama Indians that lived on the bluff that is now known as Bunker Hill, near Lytle Creek. Two years later the settlement was destroyed by superstitious local tribesmen, following the powerful earthquakes that shook the region. Several years later, the Serrano and Mountain Cahuilla rebuilt the Politana rancheria, and in 1819 invited the missionaries to return to the valley. They did and established the San Bernardino de Sena Estancia. Serrano and Cahuilla people inhabited Politana until long after the 1830s decree of secularization and the 1842 inclusion into the Rancho San Bernardino land grant of the José del Carmen Lugo family. 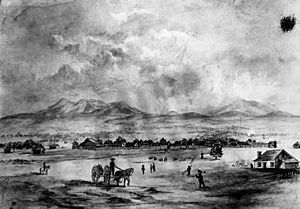 The city of San Bernardino one of the oldest communities in the state of California, and in its present-day location, was not largely settled until 1851, after California became a state. The first Anglo-American colony was established by pioneers associated with The Church of Jesus Christ of Latter-day Saints or Mormons. 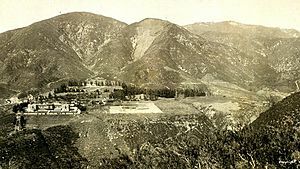 Following the Mormon colonists purchase of Rancho San Bernardino, and the establishment of the town of San Bernardino in 1851, San Bernardino County was formed in 1853 from parts of Los Angeles County. Hardworking Mormon colonists developed irrigated, commercial farming and lumbering, supplying agricultural produce and lumber throughout Southern California. The city was officially incorporated in the year 1857. Later that year most of the colonists were recalled by Brigham Young in 1857 due to the Utah War. Once highly regarded in early California, news of the Mountain Meadows Massacre poisoned attitudes toward the Mormons. Some Mormons would stay in San Bernardino and some later returned from Utah, but a real estate consortium from El Monte and Los Angeles bought most of the lands of the old rancho and of the departing colonists. They sold these lands to new settlers who came to dominate the culture and politics in the county and San Bernardino became a typical American frontier town. 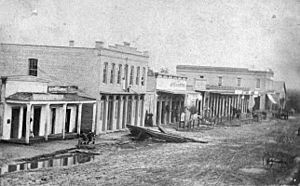 Many the new land owners unlike the sober Mormons, indulged in drinking at saloons now allowed in the town. Disorder, fighting and violence in the vicinity became common, reaching a climax in the 1859 Ainsworth - Gentry Affair. 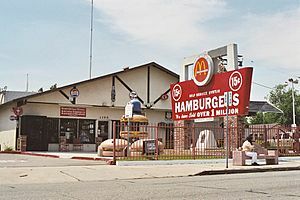 San Bernardino won the All-America City award in the early 1980s, but the city subsequently went into general decline and has only recently begun to recover from the three recessions of the late 20th/early 21st centuries. 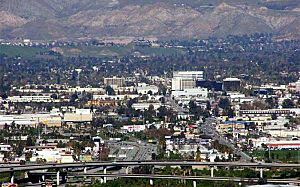 San Bernardino skyline in 2004 with downtown on the right and I-215 on the left. San Bernardino is unique among Southern Californian cities because of its wealth of water, which is mostly contained in underground aquifers. A large part of the city is over the Bunker Hill Groundwater Basin, including downtown. This fact accounts for an historically high water table in portions of the city, including at the former Urbita Springs, a lake which no longer exists and is now the site of the Inland Center Mall. Seccombe Lake, named after a former mayor, is a manmade lake at Sierra Way and 5th Street. The San Bernardino Valley Municipal Water District ("Muni") has plans to build two more large, multi-acre lakes north and south of historic downtown in order to reduce groundwater, mitigate the risks of liquefaction in a future earthquake, and sell the valuable water to neighboring agencies. 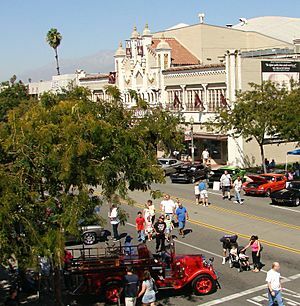 San Bernardino features a hot-summer Mediterranean climate (Csa in the Koeppen climate classification) with mild winters and hot, dry summers. Relative to other areas in Southern California, winters are colder, with frost and with chilly to cold morning temperatures common. The particularly arid climate during the summer prevents tropospheric clouds from forming, meaning temperatures rise to what is considered by NOAA scientists as Class Orange. Summer is also a lot warmer with the highest recorded summer temperature at 117 °F (47.2 °C) in 1971. In the winter, snow flurries occur upon occasion. San Bernardino gets an average of 16 inches (406 mm) of rain, hail, or light snow showers each year. 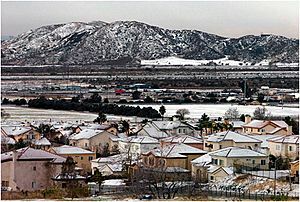 Arrowhead Springs, San Bernardino's northernmost neighborhood gets snow, heavily at times, due to its elevation of about 3,000 feet (910 m) above sea level. The city of San Bernardino is in the process of developing an historic district around the 1918 Santa Fe Depot, which recently underwent a $15.6 million restoration. When completed, this area will connect to the downtown district with period street lights and street furniture, historic homes and other structures, a new museum, coffee bars and, a mercado with an architectural style in keeping with the Mission Revival station. The population was spread out with 67,238 people (32.0%) under the age of 18, 26,654 people (12.7%) aged 18 to 24, 56,221 people (26.8%) aged 25 to 44, 43,277 people (20.6%) aged 45 to 64, and 16,534 people (7.9%) who were 65 years of age or older. The median age was 28.5 years. For every 100 females there were 97.2 males. For every 100 females age 18 and over, there were 94.0 males. 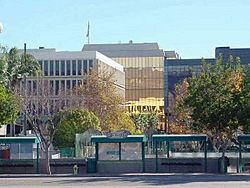 Western, central, and parts of eastern San Bernardino are home to mixed-ethnic low-income populations, of which the Latino and African-American populations dominate in the city. Historically, many Latinos, primarily Mexican-Americans and Mexicans, lived on Mount Vernon Avenue on the West Side. Since the 1960s, the Medical Center (formerly known as Muscoy) and Base Line corridors were mostly black, in particular in the east side and west side areas centering on public housing projects Waterman Gardens and the public housing on Medical Center drive. The heart of the Mexican-American community is on the West and Southside of San Bernardino, but is slowly expanding throughout the entire city. San Bernardino's only Jewish congregation moved to Redlands in December 2009. 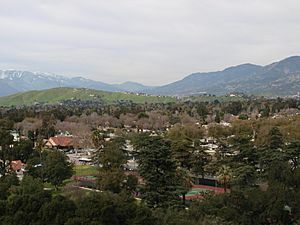 Some Asian Americans live in and around the city of San Bernardino, as in a late 19th-century-era (gone) Chinatown and formerly Japanese-American area in Seccombe Park on the east end of downtown, and a large East-Asian community in North Loma Linda. Others live in nearby Loma Linda to the south across the Santa Ana River. California State University, San Bernardino (CSUSB) Coussoulis Arena. 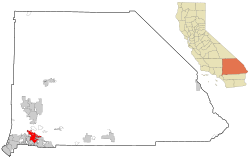 San Bernardino, California Facts for Kids. Kiddle Encyclopedia.